If you’re planning a visit to Hawaii, you already know that the list of possible activities is endless. However, there are many reasons that kayak tours should top that list. Twogood Kayaks Hawaii in Kailua offers guided tours that allow participants to explore the beauty of the nearby islands. Below, they explain why the Mokulua Islands are a premier destination. The Mokulua Islands are home to several pristine, white sand beaches. 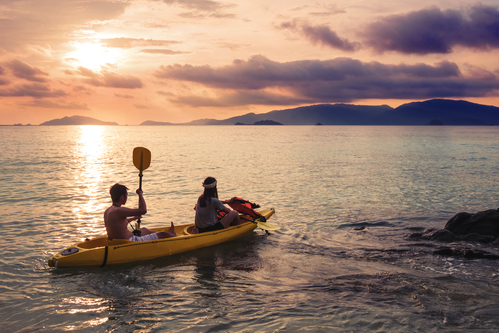 Your kayak tour guide will lead you through glistening, crystal clear waters to a hidden spot. There, you’ll be able to swim, splash, or just enjoy relaxing on the beach. Once you’re on the islands, you can take a leisurely hike to see unique attractions. Stroll on easy trails or challenge yourself to rock climbing. Exploring the area by foot is guaranteed to provide you with an incredible view and a firsthand view of local flora and fauna. Home to 12 different species of seabirds, these islands offer bird watchers an opportunity to observe and take photos. Kayak tours are the perfect way to quietly appreciate these beautiful creatures, allowing you to get close without scaring them off. The Mokulua Islands are home to the world famous Queen’s Bath tide pool. After arriving on your kayak tour, you’ll take a short hike past a waterfall and over lava rock. This tide pool is an excellent place to swim and observe marine life. To enjoy the Mokulua Islands to their fullest, kayak tours are the way to go. Twogood Kayaks Hawaii in Kailua offers guided tours and kayak rentals to access the islands. Take advantage of one of their many planned excursions on your next trip to be immersed in the natural beauty of Hawaii. To learn more, call (808) 262-5656 or visit them online.